Nancy Sandars is descended on her mother's side from James Ramsay, the 18th Century abolitionist of the slave trade. On 4th October 2006 in Little Tew there was a small tea party for which the source and inspiration lay in the last decades of the 18th century. By a curious coincidence three descendants of the first effective abolitionists of the Slave Trade were all able to meet together: Carola Dodds descened from Thomas Clarkson was staying with George and Davina Huxley in Church Enstone, Sara McCrae's ancestor was Granville Sharpe and Nancy Sandars is descended from James Ramsay. All three knew each other and worked together. Trade and of the early abolitionists. Of one of them, James Ramsay, there is a short life, written rather appropriately, by a Nigerian, Folarin Shyllon. Of the early abolitionists Ramsay, a naval surgeon, was probably the one who had the most first hand experience of the trade, having volunteered to go onto a slave ship struck by an epidemic in the West Indies. 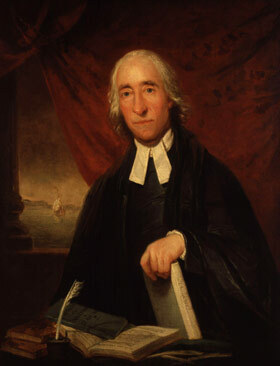 He was so appalled by the conditions he saw and then, after having an accident on board ship, he left the navy and entered the church, with the help of Admiral Middleton, the captain of his ship, the Arundel, and who eventually appointed him to the living of Teston in Kent, his own home. Before that Ramsay spent the best part of 20 years in St Kitts. He married the daughter of a planter. In 1762 –1781, he held a living in St Kitts and worked for the welfare and conversion of the slaves, using also his medical skills. But the hostility of the planters increased and when he proposed that the slaves should be allowed to attend Church on Sundays he was finally driven from the island. The Planters were a very powerful body, so much so that Burke, though sympathetic to abolition, refused to take them on and those who did realised they were "marked men". It would be like attacking the oil interests of today. At Teston, James Ramsay assisted his neighbour and patron, Sir Charles Middleton, later Lord Barham, with his work on the Navy Board. In the course of his frequent conversations he again and again raised the plight of the African slaves in the British West Indies. Lady Middleton especially urged him to unearth the essay he had written in the West Indies on the Treatment and Conversion of African Slaves in the British Sugar Colonies. At Teston with the Middletons he met Thomas Clarkson who stayed with him for a month, and William Wilberforce, so that he was able to give them his first hand experiences. There are paintings in The National Portrait Gallery of Ramsay (above) and of Clarkson by von Breda. The Bishop of Chester gave a well-publicised sermon using the essay before it was published in 1784. Credit he said was due to "The Rev. James Ramsay who had resided nineteen years on the island of St Kitts where he made the state of the slaves his particular study". It was those years that were the subject of the virulent libels published against Ramsay by the Planters and their London representatives in the 1780's. One, Molyneux, wrote in 1789 "our enemy is dead, I killed him". In 1784 Ramsay was already a very sick man, but he did see William Pitt before he died at the Middleton's house in London in 1789.